This is a composite image of a distant quasar, GB 1428+4217, in X-rays (blue), radio waves (purple) and Hubble’s vision (yellow). 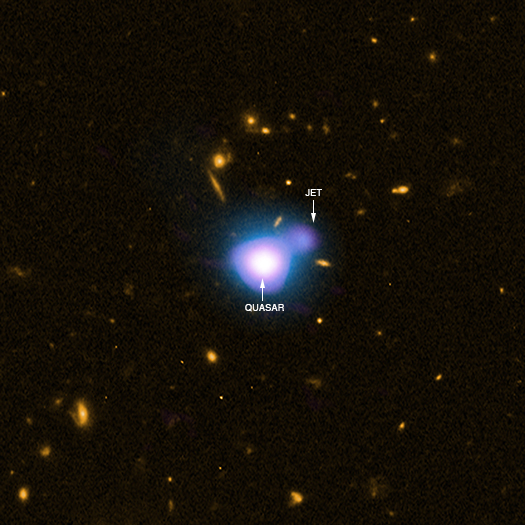 The quasar is ejecting a huge jet. Mathematical efforts at explaining jets and outward flowing star streams has produced the greatest mythology in history. The scientific universe is intensely mathematical, yet it is crammed full of undetectable, magical things. The scientific universe is 99% undetectable in any part of the light spectrum. The undetectable things only exist in the world of mathematical symbols. Yet, scientists often use mathematics to refute biblical creation. Despite this, the evidence for a literal, biblical creation is visible in galactic history. There is not a single mathematical formula in the Bible. The fundamental theorem of algebra was invented by Muslim scholars long after the apostles died. (The Greeks used geometry in their science). The anti-bible crowd may point out that the ratio pi is wrong in 1 Kings 7:23. The word circumference is a verb in this text. They were walking around the bronze sea – not calculating a mathematical ratio. The ancients could build a round clay mold using a central peg and a rope to cast a bronze basin without even imagining the ratio pi. With a sighting marker on a rope attached to four solstice poles on a large circle, the ancient Britons could predict eclipses. They did so without complex mathematics or a standard unit for measuring angles. We forget the simplicity of the ancient ways because we only know mathematical methods. 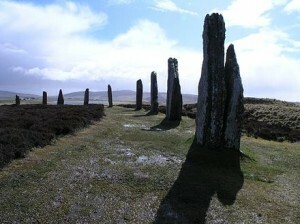 The photo of the Ring of Brodgar is from Wikipedia under a CC 2.0 attribution license by LimoWreck. This stone circle from Orkney was probably used as an ancient calendar and predictor of astronomical events. Numbers and formulas are only symbols, they have no actual reality. They exist only in minds. So why do scientists believe the universe follows mathematical laws, which they claim work locally? The laws only work locally in the realm of symbolical reality using the definitions and the methods provided by the assumptions of science. Scientists imagine that 84% of the matter in the universe is invisible. They speculate about invisible black holes, vacuums that stretch light and push galaxies away from a big bang. These things how no counterpart in the world of visible reality. They were invented to support the fundamental assumption implicate in the mathematical laws. The problem is that mathematical reality is defined operationally. Take the fundamental measuring unit for empirical science, the second of time. No one has detected any time. Solomon claimed that long durations (Hebrew olam, Greek and English eons) are in our minds, which is why we cannot understand all that God has done from beginning to end. Newton and Einstein assumed that time exists and clocks measure it. You must believe that matter has a fixed essence, an unchanging nature, to invent an operation definition such as: 9,192,631,770 oscillations from cesium 133 is a fixed duration second. An operational definition is not concerned with whether time actually exists. It simply defines it and goes about mathematically manipulating it as though it were real. Atomic clocks are really two clocks – the input and output clock. The input clock is tuned via a feedback circuit for a maximum signal strength at the input of the output clock. If atoms were changing themselves internally, all atomic clocks would keep tuning themselves to the changing atoms. Scientists simply assume the basic metaphysics of the western system, define seconds mathematically and invent meters, velocities, mathematical laws and constants – all based on their basic assumption. NASA compare their hydrogen maser atomic clocks with signals sent to and returned (transponded) from distant spacecraft. In the Pioneer Anomaly, local atomic clocks were accelerating in the same direction and manner as the light clocks in hundreds of billions of ancient galaxies, at many ranges. Our mathematics works with great precision, says the scientist. It only works locally because scientists define physical reality with symbols that depend for their existence on the basic notion that atoms are perpetual motion engines. The fundamental definitions, the measuring units, the mathematical constants and laws, the entire structure of mathematical science exists in the symbolical realm, a realm that has no counterpart in the visible world of nature or in the ancient light that reveals cosmic history. Light is the fundamental definer of reality, not mathematics. All physical reality involves light. The Bible states that light exposes error and reveals the truth because all that is visible is light, phos estin (Ephesians 5:13). Matter is a relation with light. The Earth had no extension until God’s wind continued (in unbroken continuity) to dither as He continually commanded light to continue to be. This is why matter has non local and dualistic properties because everything that exists involves a relation with light. Galactic history reveals a literal, grammatical (rather than the traditional Latin) interpretation of biblical creation. God finished the creation of the heavens and earth first. However, at that stage what he made was without form. How did the Earth begin to receive form? God continued to command light to continue to be. Half way through the creation week, he began to form the plural heavens (the Sun, Moon and stars) and spread them out. Indeed, we confirm the words of Hebrews 11:3, that the plural eons (Greek aionas) were prepared by the word of God, so that what is seen was not made out of things which are visible. In countless galaxies at many ranges, we observe that the stars continue to form and spread out from things not seen, the formelss things in the heart of every galaxy. We observe how the orbits accelerate along with the atomic clocks as billions of galaxies grew out of their unformed origins. We see that the universe has vast age, as the Bible plainly states. Yet the genealogical records show that our planet has only orbited the Sun about 6,000 times. Before you mathematically close your mind, look at cosmic history. The orbits continually accelerate outward along with the accelerating atomic clocks as billions of galaxies grew outwards into huge growth spirals. I recommend that you spend a few hours examining the images and spectra of ancient galaxies at many ranges. It is there that we see God’s great glory. We see creation as spelled out in the literal text. You can test all mathematical models of the universe against visible cosmic history. All the mathematical theories and laws fail in the visible reality of the real universe. How could mathematics fail? The fundamental assumption upon which mathematical science was contrived is visibly false. Look and glorify the wisdom of the creator who can make foolish the wise of this age even using their mathematical skills to defeat them. Look!